↑ 1.0 1.1 "MØ Bio". AllMusic. ↑ Raymer, Miles (2 March 2015). "Diplo's Major Lazer project teams up with DJ Snake and MØ for 'Lean On'". Entertainment Weekly. สืบค้นเมื่อ 6 November 2016. 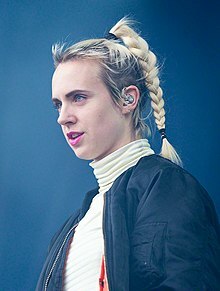 ↑ "How Do You Pronounce Danish Singer MØ's Name? Hint: Your Guess Is Probably Wrong". Billboard. 11 November 2014. Archived from the original on 14 December 2014. สืบค้นเมื่อ 6 November 2016. ↑ Carley, Brennan (30 December 2014). "Mø Reflects on 2014 With Emotional New Single, 'New Year's Eve'". Spin. สืบค้นเมื่อ 6 November 2016. ↑ Lester, Paul (12 October 2012). "New band of the day: MØ (No 1,371)". The Guardian. สืบค้นเมื่อ 3 April 2014. ↑ "Interview, MØ : A tomboy chasing dreams". Crumb Magazine. 19 March 2013. ↑ Wass, Mike (10 October 2014). "Iggy Azalea Is Going To Perform On 'SNL' And Release 'Beg For It' (Featuring Mø) As Her Next Single". Idolator. Spin Media. สืบค้นเมื่อ 11 October 2014. ↑ "Se de nominerede til Steppeulven 2014 - Nyhed". Gaffa.dk. สืบค้นเมื่อ 3 December 2015. ↑ "Reportage: Steppeulven 2015 - Nyhed". Gaffa.dk. 25 January 2015. สืบค้นเมื่อ 3 December 2015. ↑ "Billboard Music Awards 2016 Nominees and Winners". Billboard. 22 May 2016. สืบค้นเมื่อ 22 September 2016. ↑ "MØ wins FOUR Danish Music Awards". Chess Club Records. สืบค้นเมื่อ 2 December 2015. ↑ "EBBA, the awards for best European new music". European Border Breakers Awards. สืบค้นเมื่อ 20 August 2016. ↑ "GAFFA-Prisen Awards 2013". Gaffa.dk. สืบค้นเมื่อ 20 August 2016. ↑ "GAFFA-Prisen Awards 2014". Gaffa.dk. สืบค้นเมื่อ 20 August 2016. ↑ "GAFFA-Prisen Awards 2015". Gaffa.dk. สืบค้นเมื่อ 20 August 2016. ↑ "Drake, The Chainsmokers Lead 2017 iHeartRadio Music Awards Nominees". Billboard. 4 January 2017. สืบค้นเมื่อ 16 February 2017. ↑ "Justin Bieber, Nicki Minaj and Ed Sheeran among winners at MTV EMAs". Guardian. 25 October 2015. สืบค้นเมื่อ 20 August 2016. ↑ "Musical.ly Partners With MTV VMAs for Song of Summer Challenge". Billboard. 23 August 2016. สืบค้นเมื่อ 27 August 2016. ↑ "The Phonofile Nordic Music Prize nominees announced". Music Finland. 11 February 2015. สืบค้นเมื่อ 20 August 2016. ↑ "Shortlist - UKMVA". UKMVA.com. Archived from the original on 22 September 2016. สืบค้นเมื่อ 22 September 2016. ↑ "WDM Radio Awards 2017". LOS40. สืบค้นเมื่อ 21 February 2017. ↑ "Zulu Awards". zuluawards.dk. Archived from the original on 23 August 2016. สืบค้นเมื่อ 20 August 2016. หน้านี้แก้ไขล่าสุดเมื่อวันที่ 21 ตุลาคม 2560 เวลา 15:12 น.